The vault is leased for 10 years. The lease may be renewed at the end of this period. The tablet can accommodate up to eleven lines of inscription. Room may be left for an additional inscription at a future date. 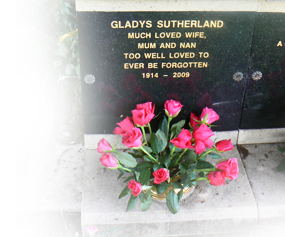 A floral tribute of freshly-cut flowers may be placed in the flower container. The gardeners will remove the flowers once they have died. No other item may be placed on or by the Sanctum.